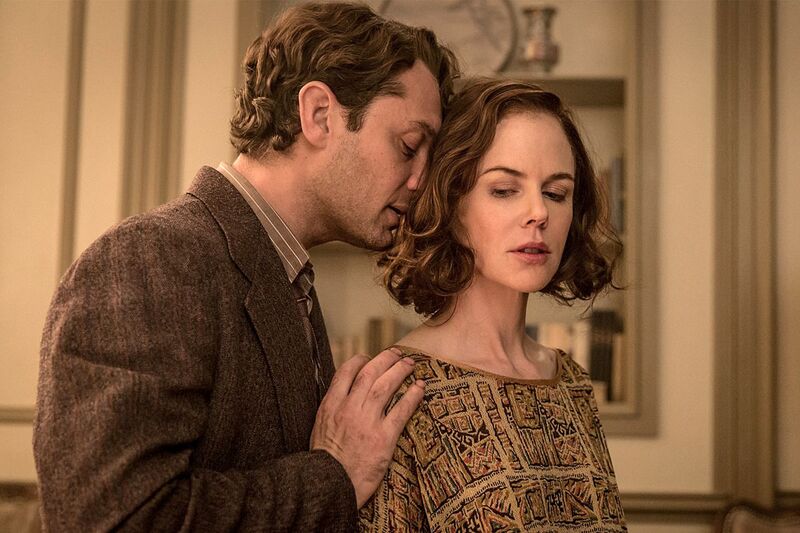 Nicole Kidman plays married costume designer Aline Bernstein, who has a scandalous affair with Thomas Wolfe in the literary biopic. When are literary biopics ever . . . literary? An oxymoron, the term usually describes sensationalistic yarns that cover every aspect of an author's personal life - his or her sexual hangups, drug addiction, legal and economic woes - but hardly ever his actual job, writing. British director Michael Grandage's Genius, an affecting if uneven drama about that most American of authors, Thomas Wolfe, tries to buck that trend. Well-written, gorgeously shot, and expertly edited, the film is also an exasperating exercise in good intentions gone wrong. For all its strengths, Genius often trades in tiresome clichés. Worse, it features a grating, sometimes unbearable over-the-top performance by Jude Law as Wolfe. Affecting a personality not unlike the hustler he played opposite Kevin Spacey in Midnight in the Garden of Good and Evil, Law plays Wolfe as a wild-eyed motormouth who doesn't so much live life as utter it in a single, never-ending, hyperbolic, adjective-stuffed, punctuation-free sentence. Law's performance as Wolfe may be accurate to the man himself, but it feels like overkill in a film that is otherwise so clearly and cleanly delineated. I suppose that's the point: Genius tries to capture how Wolfe was driven by an overwhelming compulsion to express himself, his ideas, his feelings, his observations, a feverish need that led to works that were expressly autobiographical. Grandage, an acclaimed theater director here making his film debut, comes at the material from a wonderfully fresh perspective. Adapted from A. Scott Berg's 1978 National Book Award-winner Max Perkins: Editor of Genius, the film isn't about Wolfe's life, but about the incredibly productive relationship Wolfe had with the celebrated Scribner's editor, Maxwell Perkins. Lovingly portrayed by Colin Firth as a nurturing, protective father figure, Perkins is remembered today as the genius who discovered F. Scott Fitzgerald (played here by Guy Pearce) and Ernest Hemingway (Dominic West). Genius portrays with almost breathless intensity how Perkins helped Wolfe sculpt his first two major novels, Look Homeward, Angel (1929) and Of Time and the River (1935) from massive manuscripts that had more in common with insanely fecund, overgrown Amazonian forests than what we'd consider books. In scenes that will delight Wolfe fans, Law and Firth give us readings of Wolfe's unedited prose, then walk us through the process by which the raw product was refined in the editing process. Genius doesn't entirely skip on Wolfe's personal life. Tightly edited vignettes give us glimpses into his fraught, scandalous love affair with married costume designer Aline Bernstein (Nicole Kidman) and his rivalry with Fitzgerald and Hemingway, Perkins' other heavyweight authors. Less interesting are the ridiculously idyllic scenes we get of Perkins' picture-perfect Norman Rockwell existence with his devoted wife (Laura Linney) and their five daughters. Grandage should know better than to engage in such silly hero-worship. I wish I could love Genius. It's so thrilling when it clicks. But I can't get past its faults. Directed by Michael Grandage. With Jude Law, Colin Firth, Nicole Kidman, Guy Pearce, Dominic West. Distributed by Lionsgate. Parent's guide: Rated PG-13 (some thematic elements and suggestive content). Playing at: Ritz 5, Carmike Ritz 16.